Australian-ification is what I need. 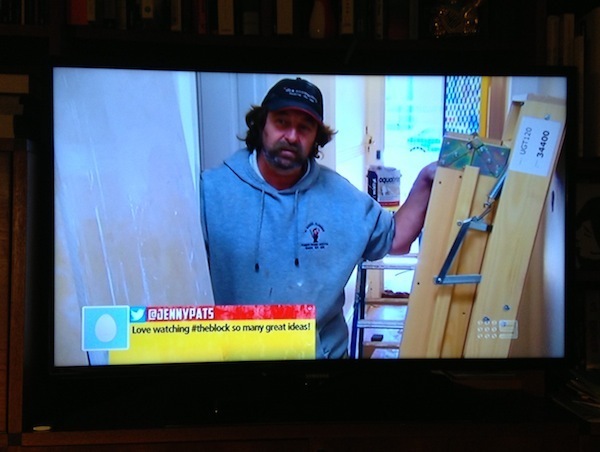 So my wife and I have been watching a show called ‘The Block All Stars’ on Channel Nine. We eventually plan to buy a house in Sydney and seeing people going through renovation nightmare provides a hint of what we have to look forward to, and will hopefully provide hints and tips. As part of the Block they show comments from viewers made on the social network sites, Facebook and Twitter. This is great I thought, aggregating popular tweets to improve the viewing experience for the user and to provide a window into the minds of the everyday viewer. However, as I watched the episode I quickly realised that the tweets were all too ‘perfect’ and all too apt. Often a post would be shown exactly at the same time as the action appeared on screen, or the posts were always too positive and never overly critical. The posts seemed too good to be true. There was never even a typo in sight! So next time a tweet appeared I quickly checked out some users. @GNugnug sent 13 tweets all about ‘The Block’ and hadn’t made a twitter, a squark or even a chirp before the show was aired. I wasn’t even able to find one user who went by the name of @mariefleur7. It all made me just a little disappointed, and also annoyed at the apparent low-tec methods the shows producers were using to implement social media into their shows. It makes me wonder what the point is of including comments, if they’re not real? ‘Second screen’ activities are hugely prevalent globally, and we know they are equally both in the UK and Australia (where OD staff have done projects identifying user behaviour and motivations for discussing television shows on social networks). With apps such as Zeebox and Fango they have tried to ensure that conversations happen in apps, thereby monetising these interactions with adverts, app purchases and sponsorship deals. Seems fair enough but the UX research conducted found these services to be pretty distracting and uninspiring for a viewer. So there is a challenge, how can you drive customer engagement and encourage a conversation around your shows, supporting free speech whilst at the same time upholding censorship and classification values, whilst making the conversation inclusive and real? It’s definitely a difficult challenge, but not one that I think the Block All Stars has met. Perhaps I’m wrong and the viewers that send their messages are real and not a television fabrication, tweet me if you’re out there! So next time I watch the show I might just tweet like a songbird trying to get my message to appear. In the meantime, I’ll continue to keep researching the various ways to integrate social media into television shows and thinking about how the user experience of watching TV can be brought into the modern age, or perhaps more importantly if it even needs to be changed at all!!!! Dave is a User Experience Consultant at Objective Digital. Originally from the UK, Dave loves the arts and is enthusiastic about music, films and design. He’s a creative person and enjoys photography and being active in the photographic community. This entry was posted in User Experience by Objective Experience. Bookmark the permalink.